In order to be successful, your bar or restaurant needs to keep current customers coming back, and get new customers coming it. Here are six ideas for promotional tactics you can use to encourage both new and repeat business. 1. Loyalty cards: Depending on your type of restaurant, this could range from a simple “buy 10 sandwiches, get the next free” punch card for a sandwich shop to a sophisticated bar-coded card your servers can swipe. Search online for “gift cards” and you’ll find companies that offer a range of loyalty card options. 2. Bouncebacks: Reward customers at the end of their visit by giving them a voucher for $5, $10 or $20 off their next visit, depending on your establishment. Encourage redemption by putting a time limit on the voucher--two to four weeks is a good time frame. You can also issue vouchers good for a specific daypart, such as $10 off dinner or happy hour. This can encourage customers to come in during normally slow times at your establishment. 3. Specials: Promoting a certain menu item or drink special for a limited time is always a good way to attract customers. You may want to work with vendors to come up with ideas for promotions that benefit both of you. For instance, alcoholic beverage companies often work with clients to hold promotions. 4. Birthday marketing: Collect customer data such as emails, addresses and birth dates using forms you hand out with the check. Send your bar or restaurant customers vouchers good for a certain amount, a free appetizer or a free dessert to be used the month or week of their birthday. 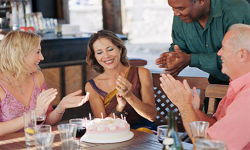 You’ll get not only the customer, but also their friends and family to help them celebrate. 6. Contests: Games and contests are a great way to engage customers in your bar. Consider hosting a trivia contest (you can do this live, or sign up with one of the many services that provide online trivia contests for bars), holding a karaoke night, or even getting creative with games like bingo. Whatever type of contest you hold, be sure the prizes you award to the winners include vouchers for your bar! Have any questions about these promotion ideas? Connect with a SCORE mentor online or in your community today!